Author s1tecur8rPosted on September 20, 2017 September 21, 2017 Categories talksTags On knowledge for enablementLeave a comment on Beyond access to knowledge, what next? It is a widely known fact that more information does not lead to better understanding and more ‘informed’ action. We now face the new challenge of making sense of all the knowledge available to us at the press of a button. The central challenge facing most knowledge-based institutional systems – education, health, knowledge-driven industries, communications, etc., is the paradigm shift in man’s relationship to knowledge and its use. For nearly 500 years now, there has been an increasing distribution of knowledge: first in the form of information embodied in newspapers, books, magazines; second, films & television, and finally, internet & mobile-based communications. This 500 year march has been marked by an increasingly intense drive to reduce communication costs, increase reach and lower the cost to user of entertainment and information. In the past 20 years, with the rapid growth of the internet, the quantum and range of information available to users has gone up dramatically – leading to a new situation unseen in man’s relationship with information before – too much ‘access’ to knowledge. It is at this juncture, that man faces a new challenge, which he has not encountered meaningfully in his history. The challenge of making sense of it all: the challenge of meaningful utilization of knowledge for productive use – the challenge of assimilating information not at a societal level alone, but also at an individual level. This challenge – the challenge of assimilation – can be called ‘the last 12 inches problem’: the distance between the personal computer screen and the user’s head. This is the ‘cognitive distance’ between information and understanding which needs to be crossed after crossing the ‘geographical distance’ between creator of knowledge and user of knowledge. Man has never faced the problem of use – whether food, clothing, shelter or even primary education. Availability has implied use of these resources. For example, if food is made available, then it follows that people have the ‘capacity to consume’ it. If clothing is made available, it is taken for granted that people will be able to ‘use’ them. In fact, these are all physical access goods, wherein, the problem of ‘capacity to use’ is never brought up as an issue in distribution. At a superficial level, information is perceived as no different from these physical access goods. If there is more information distributed more widely, then it apparently follows that it will be used effectively by receivers of that information. But study after study, notable among them being the work of Paul Strassman (a leading analyst of the cost-effectiveness of IT Systems) and Richard Saul Wurman (who coined the term Information Anxiety and defined it as the black hole between data and knowledge) have shown this is not necessarily true. More information does not lead to better understanding and more ‘informed’ action. Physical access to information, like access to roads, is a necessary ‘physical’ infrastructure that must be laid as a foundation for man’s progress. But the real challenge before mankind will be in creating universal access to understanding – ‘cognitive access’ – i.e., enabling the common man to fruitfully and meaningfully use information in a manner that will result in tangible improvements in the way he works and the way he lives. Creating cognitive access is not an easy terrain to cross. Assimilating information depends upon the users’ ability to understand, the context for the information, and the link between the new information and the existing knowledge base already in the head. Creating cognitive access is clearly an ‘individual-centric’, ‘difficult to measure’, ‘complex’ concept. It is related to creating the optimal conditions for users to understand and assimilate knowledge easily. Correspondingly, creating ‘universal’ cognitive access, i.e. creating optimal conditions for the easy and effective use of available knowledge by all those who receive it is the key challenge intrinsic to the goal of creating universal access to knowledge. If we are to be content with allowing each individual to gain cognitive access based only on his or her individual capability, then we are opening the doorway to a problem that has already ravaged this country once, and has the capacity to destroy it again: the ‘understanding divide’ – which creates a ‘knowledge-rich’ ruling class that controls access to the very source of all progress! Only this time it will not be physical access to information, but access to the benefits of that information. As more and more information is made available as a result of fiber-optic highways and the widespread availability of communication infrastructure, we will see the contours of the ‘understanding divide’ become clearer. Those who understand will benefit immensely from the investments we are making in information and its availability. Those who don’t will be left further behind than they were before! * Paul A. Straussman , “The Transformation of work in the Electronic Age” [pg.27, 170, 184], Free Press. ** Richard Saul Wurman , “Information Anxiety”, Doubleday [1st edition]. The term “knowledge society” is an amorphous idea, meaning many things. A society where information and ideas are available in quantities and ease of access never seen before in the history of mankind. A society where the ‘mode of production’ is based on knowledge i.e., mankind’s modes of production have evolved from agricultural to manufacturing/ industry and now to knowledge. A society where Man’s relationship with knowledge is undergoing a change – from viewing knowledge as a resource for learning about the world, to viewing knowledge as an instrument for engaging with the world differently and finally as an end in itself. In this paper, we focus on the third dimension of the knowledge society – Man’s evolving or transforming relationship with knowledge – as the foundation for the knowledge society we will see emerging in the 21st Century. 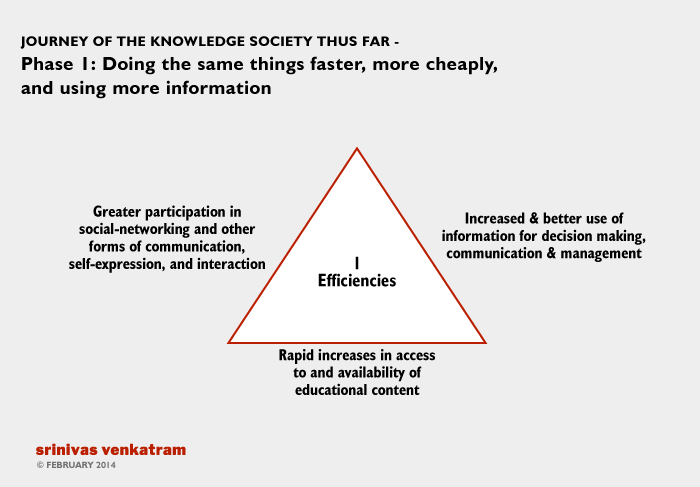 The knowledge society has, thus far, been characterized by six key trends. The growth in communication technologies such as internet, mobile, and satellite television. These technologies have enabled information to be transmitted cheaply and effectively to all parts of the planet. The growth in ‘enabling tools and models’ that allow individuals to exploit these possibilities in several ways. These take on the form of social networks like Facebook and Twitter, search mechanisms like Google – a space of continuous rapid innovation especially in the first decade of the 21st Century. The consequent explosion in knowledge co-creation in society, i.e., millions of users are creating content (comprising their own ideas, thoughts, and opinions), with instant distribution capacity – through their membership of social networking sites, blogs, and putting up their own content for the world to see. This knowledge co-creation is allowing the emergence of multiple new thought streams – lending legitimacy and a new global peer community, to political, social, and personal concerns of all kinds. (ii) the need for almost everybody to become a knowledge worker of one kind or the other, (iii) the development of efficiency tools for management of enterprises, (iv) the development of knowledge enabled services such as customer support helplines both within and outside the organization. The transformation of value in traditional devices, by introducing automation, communication and ‘intelligence’ into these devices. This has resulted in enhanced responsiveness, connectivity and ‘value to user’ of these devices. The emergence of IT-enabled educational models such as (i) the availability of world-class content from top universities, (ii) the availability of content at low cost due to the use of digital formats, (iii) the possibility of new rich educational content, etc. What we have described thus far is the “access revolution” – access to information and knowledge that gradually transforms: how people work, take decisions, and interact with each other, and so on. These shifts are themselves breathtaking in their scope and impact. But there is a second, deeper, and more profound aspect of the knowledge revolution that is slowly unfolding in the world. This aspect refers not to the availability and use of information and ideas, but instead refers to how people are assimilating these ideas and thereby transforming their vision of life, their notions of purpose, meaning, fulfillment, and contribution. In the light of this model, we can classify knowledge into types – functional knowledge and being-level knowledge. Knowledge when connected to the function dimension of the personality is perceived and interpreted in the context of an external or objective reality. It takes on the form of data, information, and analysis, and may be called functional knowledge. Knowledge when connected with the being dimension of the personality takes on the form of individual vision, meaning, purpose, fulfillment. It can be called being-level knowledge. These two types of knowledge – function-level knowledge and being-level knowledge have, in previous centuries, been distinct and unconnected. The West has been relentlessly focused on the access, comprehension, and use of functional knowledge, while the East has been largely focused on the inner transformation and development of being-level knowledge. 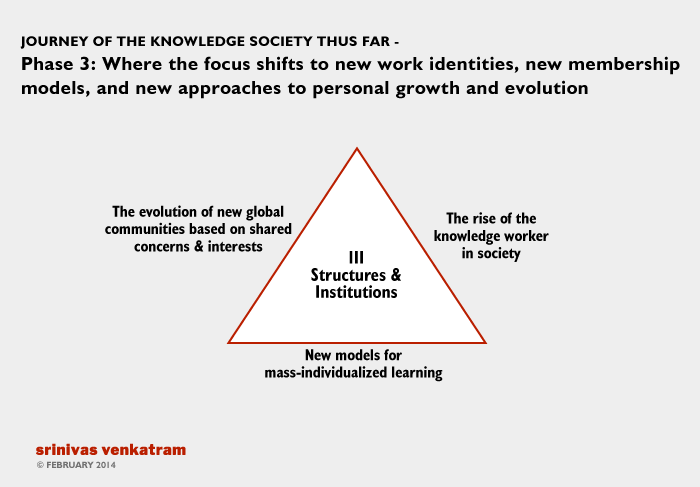 As the knowledge society unfolds, we are beginning to see a new vision of knowledge – built around a harmonious integration between functional knowledge and being-level knowledge. Education is not the amount of information that is put into your brain and runs riot there, undigested all your life. We must have life-building, man-making, character-making, assimilation of ideas. If you have assimilated five ideas and made them your life and character, you have more education than any man who has got by heart a whole library. If education is identical with information, the libraries are the greatest sages in the world, and encyclopedias are the Rishis. It is this vision that has silently begun to unfold in society. For long it has been assumed that the only way to deal with information and knowledge is by collecting, collating, analyzing and deriving insights from knowledge. This has led to an empirical/ experimental view of knowledge deriving from the days of Francis Bacon and other Enlightenment Thinkers. Organizations and individuals have now begun to recognize that unlimited access to knowledge does not necessarily help them think better, or find solutions to the challenges they face, or even more important, find meaning or purpose in whatever they do. Thus, in the past few years, altogether new ways of thinking and working with knowledge have begun to emerge. These methods, currently classified as design thinking, solution thinking, etc., do not begin with functional knowledge (i.e., data & information), but instead with being-level knowledge – i.e., what purpose do I seek to accomplish in my life or what contribution I seek to make. The function-level knowledge that helps me organize, synthesize, and “construct” answers or approaches that serve my being-level requirements follow. This shift in primacy from function-level knowledge to being-level knowledge is resulting in altogether new ways of dealing with available knowledge in the world. As individuals and organizations begin to take empirical and “function-level” knowledge for granted, and shift their focus to “being-level” knowledge, a second related shift has begun to take place. Individuals and organizations have begun questioning the quality of purposes they seek. For example, Is the purpose of a corporation merely to maximize profits for shareholders or is it also to make a positive impact on the society and communities in which it operates? At an individual level, the question could be – What is the true purpose of my career – is it to achieve a high position in a corporation or is it to make a significant contribution to the world in and through my career? This self-questioning and self-review of “quality of purpose” has led to ideas and movements such as conscious capitalism, higher ambition, shared value, good business, etc. all of which are leading to the development of citizen corporations or enlightened citizens who are concerned about expanding themselves beyond narrow self-interest to enlightened self-interest. The search or seeking of a higher purpose for work has led also to a simultaneous need for a means to realize this desire. Knowledge work is unique in this regard. Most forms of physical and industrial work, seek in society to create a division between the worker and the object of work. Knowledge work is unique in that it demands engagement from the knowledge worker. Put differently, a knowledge worker, in order to write a report or develop a solution to a problem must necessarily become engaged and involved in the work – and cannot (like auto factory workers) be largely disconnected or alienated from the work at hand. This “engagement” between the knowledge workers and knowledge work has a second deeper dimension – i.e. it is reflexive in nature. The quality and type of knowledge work impacts the thought process, emotions, and “state” of the knowledge worker and vice versa. Furthermore the deeper the knowledge work, the more it develops the faculty of concentration (which Swami Vivekananda held as central to all forms of learning) and more it awakens the individual’s reflexive capacities. Thus, knowledge work – well done – can deeply integrate learning & doing at the functional level and at the same time, can create the conditions for deeper orders of engagement both with oneself and the work at hand. 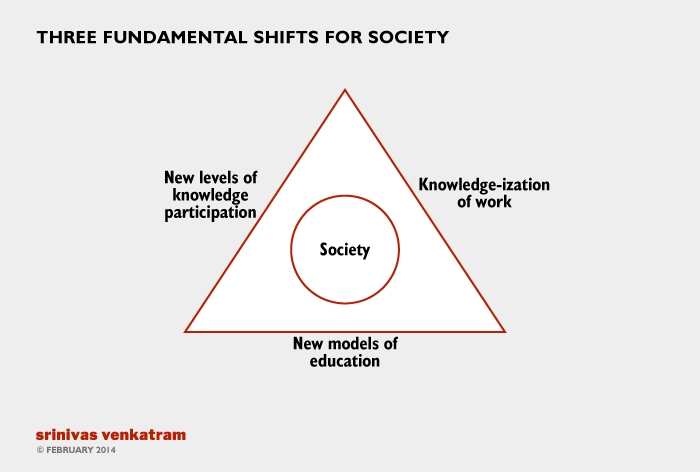 These three aspects set the stage for a fourth, and perhaps more fundamental change that is in its embryonic stages in society – the shift in the meaning of knowledge itself in society. A few decades ago, knowledge or knowing was associated with memory and knowledge of facts. But in recent years, it is being recognized that the functional capacity to handle knowledge does not in any way help us answer the being-level questions of purpose, meaning, fulfillment, etc. that are reshaping the way people think. Thus, quality of the individual’s being seems to have a direct relationship to the quality of purpose of that individual, and his/ her willingness to leverage knowledge in the service of that purpose. In that, knowledge or knowing is slowly being recognized as related to “being and becoming” of an individual and not mastery of facts or even the knowledge processing faculty of the individuals. All these ideas were, of course, well-known in the Eastern spiritual traditions , but are now entering the mainstream through the assimilation of knowledge and the development of the knowledge society. These four trends together may be seen as the deeper “spiral of assimilation” that has begun to unfold in society – a spiral that will grow in strength and intensity, leading to a knowledge society that not only works with knowledge outside, but also with knowledge within. This is the future direction in which knowledge society is likely to unfold. Talk given at the Positive Economy Forum, San Patrignano, Italy – April 2015, on the new educational models that will create ‘positive people’ for a ‘positive economy’. If we want to build a positive economy, we need thousands of ‘positive people’ to embrace and build this new world. What kind of new educational models are needed to create such ‘positive people’ at scale? Paper published by the Institute of Culture, Kolkata, February 2014, in the book “Swami Vivekananda’s Vision of Future Society”, in which Srinivas discusses how society’s relationship with knowledge has evolved over time, and proposes a shift in the way we see knowledge itself. The benefits of industry-academia interaction are well-known. The challenge we face is how to make it happen – consistently, sustainably, and effectively. The first is to acknowledge that industry and academia live in two different contexts. The context of individuals working in industry is the day to day operational and tactical challenges they face while conducting their business. In the longer run, they face evolving markets, new technologies, demands from shareholders, and changes in government policies. On the other hand, the context of an individual living in academia is the demands of teaching, creating new “knowledge products” like research papers and textbooks, managing within the institutional rhythm of exams, projects, submissions, etc. In the Indian context, a further, important challenge is how to push students to dive deep and go beyond the superficial “exam quality” thinking that dominates many institutions. There are many solutions already being used, which include consulting by academics, real-world projects by students, various conferences and forums where both academia & industry people attend, inviting industry experts to academic institutions, and, of course, sponsored projects. But the main challenge we face in all these different approaches is that they are often person-dependent or limited to specific collaborations without sustained and mutually productive engagements on either side. 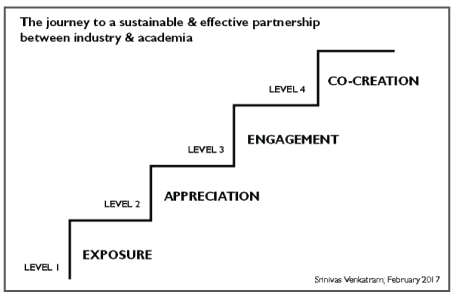 Successful industry-academia interactions appear to follow a “ladder of engagement”. As the quality of engagement increases, the collaboration between industry & academia becomes more rich, more fruitful, and more sustainable. The first step of this ladder of engagement is mutual exposure to the socio-technical challenges faced on both sides. This means an effort at articulating not just the technical but the socio-technical challenges faced both in the industrial world and the academic world. This includes exposure to implementation issues, issues of adoption, people issues, and of course issues in the state of practice/ methods, and technologies available, etc. The greater the exposure, the sharper the contribution and mutual help that can be given by academia and industry to each other. At the next level is the need for an appreciation of possibilities. Successful partnerships account for both academics and industry managers to jointly explore new types of solution possibilities, possibilities for reducing costs and increasing value creation, new ways to achieve adoption and skill building, etc. To generate these possibilities, exposure to challenges (the previous step in the ladder) is a prerequisite. As a clearer vision of possibilities emerges, it becomes necessary to shift focus to “protocols of engagement”. How do both industry and academia work together in a way where they respect each other’s time constraints (industry is always chasing yesterday’s targets while academia has to respect the academic rhythm and competing priorities of students), and also respect the space that academics need without being pushed, and the multiple demands on energy & time that managers need to constantly cope with. Furthermore, there is need to respect the shared vision that drives the collaborations. The need to create value for all stakeholders if the collaboration is to be successful. A lack of respect for value creation for all stakeholders and too much focus on the “letter” of the contract can negatively impact the possibility of long-term collaborations. As a partnership matures – both sides climb to the next and highest stage of engagement where they work together on shared outcomes. This is the stage where trust and mutual respect has reached a level where breakthrough ideas, a healthy dynamic of reflection and practice, and the harnessing of the creative capabilities and experiences of multiple participants – students, faculty, managers, technical experts, etc. – can lead to co-evolution of knowledge and true partnership between industry and academia. The key to creating sustainable and effective partnership is not chasing more projects or more funds, but is instead nurturing a steady climb on the ladder of engagement by both industry and academic participants. Society is facing a dual challenge. On the one hand, it is facing the challenge of transforming the conditions in which it lives – poverty, hunger, infrastructure, roads, sustained economic and social transformation, dealing with the effects human prosperity such as climate change, rising inequality, etc. On the other hand, it is facing the challenge of ‘internal transformation’ – creating the human capacity to deal with these challenges. None of the external challenges can be addressed unless individuals and groups (communities and institutions) develop the intentionality, the will, the self-confidence, the capacity to work together, to be able to deal with these challenges. abcIf individuals or communities remain indifferent to a challenge – they may be unable to even recognize its ramifications or awaken to its consequences in time. If individuals do not develop the will to deal with a problem, then they will not do what is necessary to solve our problems even if they recognize it and appreciate its importance. If individuals or collectives do not have the self-confidence or belief that they can indeed solve a problem then they will wait for solutions from outside – become dependent on aid or foreign help or on “leadership” and “technology” to solve their challenges. And if individuals and collectives don’t learn to overcome their narrow self-interest and come together, work together, accepting a shared destiny, then many problems will remain unsolved even if the recognition/ intentionality, will, and self-confidence exists within specific stakeholders or members of a group. Thus, the challenge of external transformation can be solved through leadership, innovation, resources and engagement. – by the unwillingness to bury egos, personal agendas, groupism, and a ‘not invented here’ attitude in order to solve a common shared challenge. These disablers together represent the challenge of internal transformation that faces mankind. abcIt’s time we wake up to this enablement challenge if we are to address our external challenges effectively. A small-big vision that may mean a new equation with success. A small-big insight that could change our relationship with the measures we accept “mindlessly” today. A small-big change in our “stance” to life that could free us from excessive analysis and enable us to get things done. A small-big framework that enables us to assess the quality of our motives and shows us a way forward. A small-big “way to think” that helps us see ourselves and, therefore, free ourselves. A small-big change that helps us become successful without falling into the “big success” trap. A small-big change that helps us become changemakers without changing the externals of our life. All of us seek new experiences in our life. This little book asks us why? Is it because we are actually seeking something called ‘cognitive freshness’ in every part of life? All of us recognize that we should be ‘creators of our destiny’ and not ‘victims of life’. This Little Book points us to the “how”. We can fulfill our unique humanness when we awaken our awareness and use this awareness to resolve the conflict between the objective (‘what is’ in the world outside) and subjective (my understanding of the world). Author s1tecur8rPosted on August 31, 2017 August 31, 2017 Categories books, writingsLeave a comment on Why Awareness?